Enzyme supplement. 50% More free. Potent & full support. Eases digestive discomfort. Plant-source enzymes. Superior VegeGuard Digestive Support with plant-source enzymes and soothing botanicals. Advanced Enzyme System formula provides: Potent, full-spectrum enzyme support – from a broad range of enzymes, including brush border enzymes to help break down all types of food including difficult-to-digest carbohydrates. Enzyme supplement. 50% More free. Potent & full support. Eases digestive discomfort. Plant-source enzymes. Superior VegeGuard Digestive Support with plant-source enzymes and soothing botanicals. Advanced Enzyme System formula provides: Potent, full-spectrum enzyme support – from a broad range of enzymes, including brush border enzymes to help break down all types of food including difficult-to-digest carbohydrates. Relief from digestive discomfort – with enzyme rich foods and targeted botanicals to help alleviate occasional gas and bloating. (This statement has not been evaluated by the Food and Drug Administration. This product is not intended to diagnose, treat, cure or prevent any disease.) Plant-source enzymes – to supplement enzyme-depleted foods including cooked or processed foods. Effective in a wide pH range for optimal digestive activity and appropriate for vegans. 100% Natural and VegeGuard screened for vegans; no trace animal ingredients. Free of artificial colors, flavors, sweeteners, preservatives and other objectionable additives often found in vitamin products. Contains no sugar, lactose, wheat, or allergenic yeasts. Advanced Enzyme System provides comprehensive digestive support with potent, plant-sourced enzymes, enzyme-rich whole foods, and brush border enzymes that support the digestion of proteins, fats, and complex carbohydrates*. This natural, vegan formula also includes botanicals that work together with the enzymes and whole foods for overall digestive support*. When taken as directed, Advanced Enzyme System can ease digestive discomfort and distress for a more balanced digestive system on a daily basis or on occasions when you need additional digestive support*. The Allergen SafeGuard, VeganGuard formula is 100 percent natural and free of sugar, artificial colors, sweeteners, preservatives, and other additives. Advanced Enzyme System contains a blend of potent and effective plant-based active enzymes along with whole foods to promote a balanced digestive system*. Each capsule contains high activity of 10 plant-based enzymes, including amylase and protease, which are more active in a wide pH range for greater support*. Brush-border enzymes, invertase and glucoamylase, break down starches for easier carbohydrate digestion and assimilation*. These enzymes can help break down different types of food that are frequently difficult for most systems to digest, resulting in less digestive upset*. Enzyme-rich whole foods, including green papaya and apple pectin, work synergistically with the plant enzymes to futher break down proteins*. This complete formula also delivers peppermint, fennel, and ginger, which are gentle on the stomach and ease digestive discomfort*. 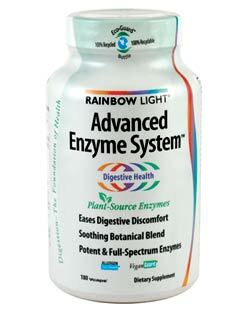 Advanced Enzyme System can also provide support for occasional indigestion, gas, bloating, and constipation. Advanced Enzyme System is guaranteed to be 100 percent natural and free of artificial colors, flavors, sweeteners, preservatives, and other additives often found in vitamin products. It also carries the Allergen SafeGuard–it contains no soy, yeast, milk, eggs, nuts, fish or shellfish–and VeganGuard seals. Take one capsule with or before meals or sprinkle on food immediately before eating. This supplement comes packaged in a 100 percent recycled and recyclable, BPA-free EcoGuard bottle with a 92 percent lower carbon footprint than virgin plastic. Rainbow Light was founded in 1981 in Santa Cruz, CA. Their mission is to be the performance leader in building a stronger state of health for their customers, the global community, and the planet. Rainbow Light’s innovative formulas all begin with a base of nutritious, whole foods and are formulated to deliver research-proven ingredients in optimal potencies and combinations for best absorption, utility, and effectiveness. From the beginning, Rainbow Light has partnered with Vitamin Angels to fight global malnutrition, providing over 24 million life-saving prenatal and children’s multivitamins to women and children in need worldwide since 1996. Rainbow Light also has a long-standing commitment to environmental stewardship and is the first and only supplement brand to offer 100 percent post-consumer recycled, BPA-free EcoGuard bottles that are also 100 percent recyclable. Advanced Enzyme System (180 Vegetarian Capsules).